Carolyn Phillips has a long tenure in market research and consumer insights with a focus on primary custom research. At Ingredion, she leads the insights function for North America, partnering with the marketing and strategy teams to build knowledge and expertise about the markets Ingredion serves, with an emphasis on the consumer. Prior to joining Ingredion, Carolyn held market insights roles on the supplier side and the client side, with responsibility for delivering strategic and actionable insights to inform business decisions and guide consumer strategy. She has experience in the healthcare/pharmaceutical, CPG and B2B space. She holds a bachelor’s degree in marketing from St. Joseph’s University and received an MBA from Temple University. 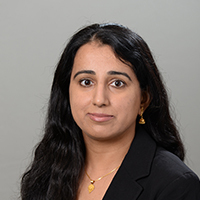 Jinat Mansuri has been with Ingredion for 19 years and is responsible for leading an Ingredients Technical Service Team in providing customer solutions and product innovation in the East Coast region, collaborating with sales and marketing on a total go-to-market approach. Jinat holds a bachelor’s degree in biology from Rutgers University.